With just four episodes left in its inaugural season, you need no longer fear for the future of History Channel’s series Vikings, which is about Vikings. 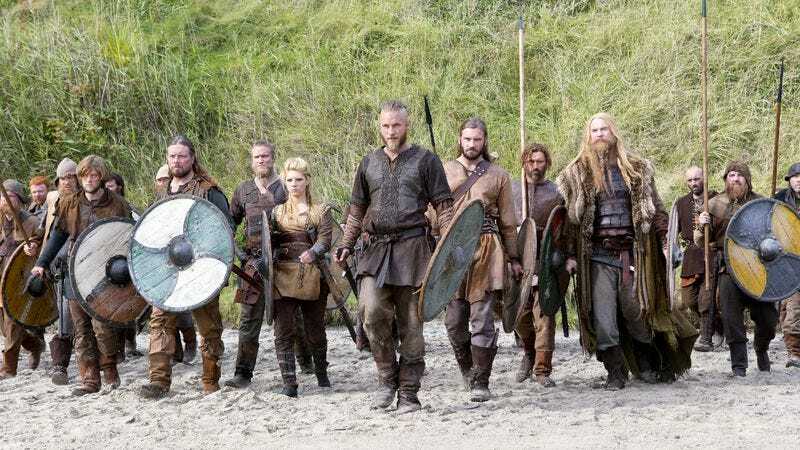 The Viking-centric series featuring substantial amounts of Viking action was renewed for a second season by the network, which gave the second season a 10-episode order as well, boosting it by one over season one’s nine episodes. The many actors who play Vikings (okay, and a Christian monk) as well as series creator and writer Michael Hirst will be back for the second season, and in its first season, the show has averaged 5 million presumably Viking-obsessed viewers over its first five episodes (though that number is boosted considerably by an inflated debut number). History announced all of this in a press release featuring frequent quotes from the network’s executive vice president of development and programming, whose name is Dirk Hoogstra, which is what you should name your first-born son. “Vikings is a win win for us. As our first scripted series, VIKINGS has paid off in a big way with critical acclaim, strong ratings and a passionate, loyal fan base. It came out of the gate strong and has stayed on top, solidifying HISTORY as a major player in the scripted genre, just as we are in reality,” said Hoogstra, who can speak in all caps. We can only assume he was surrounded by helmets, battleaxes, and a cardboard standee of Fran Tarkenton as he spoke. No word yet on if the characters will spend next season accompanied by a lovable duck companion named Kvack, but keep those fingers crossed.